On earth she was a clear light, now in heaven she is a brilliant sun. O how great the vehemence of the brilliance of this clarity! Clare was the daughter of a count and countess. Her father died young. After hearing St. Francis of Assisi preach in the streets, she confided to him her desire to live for God and the two became close friends. On Palm Sunday 1212, the bishop presented her with a palm, which she apparently took as a sign. Clare and her cousin Pacifica ran away from her mother's palace during the night. She eventually took the veil of religious profession from Francis at the Church of Our Lady of the Angels in Assisi. 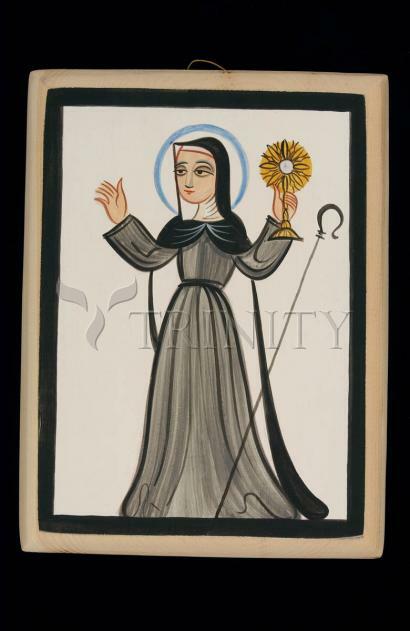 Clare founded the Order of Poor Ladies (Poor Clares) at San Damiano, and led it for 40 years. Everywhere the Franciscans established themselves throughout Europe, there also went the Poor Clares, depending solely on alms, forced to have complete faith on God to provide through people. A lack of land-based revenues was a new idea at the time. Clare's mother and sisters later joined the order, and there are still thousands of members living lives of prayer in silence. Clare loved music and composed sermons. She was humble, merciful, charming, optimistic, and chivalrous. She would get up late at night to tuck in her sisters who'd kicked off their covers. She daily meditated on the Passion. When she learned of the Franciscan martyrs in Morrocco in1221, she tried to go there to give her own life for God, but was restrained. Once when her convent was about to be attacked, she displayed the Sacrament in a monstrace at the convent gates, and prayed before it; the attackers left.